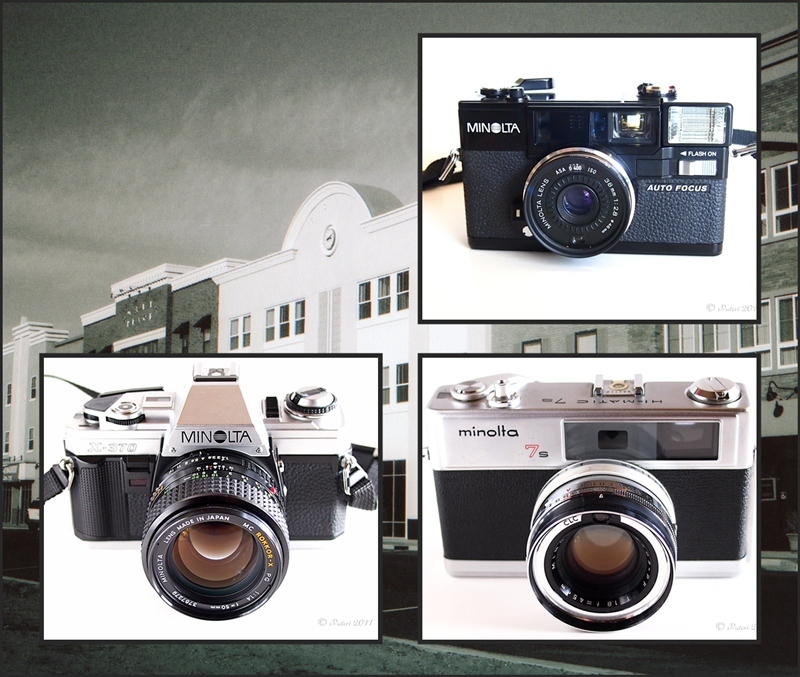 I had the opportunity to shoot black and white film on three of my Minolta cameras recently. 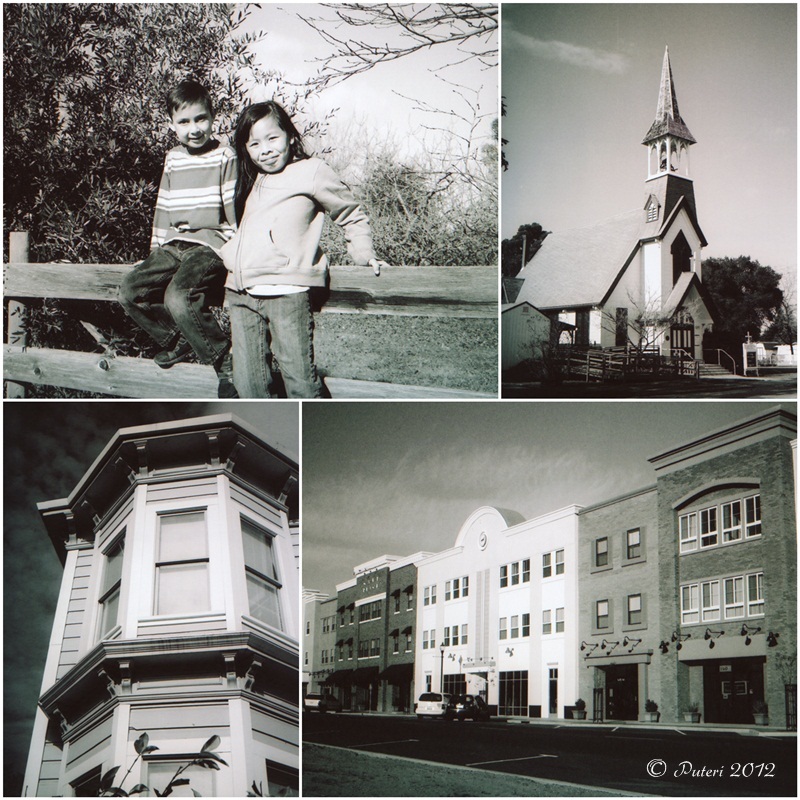 Overall, I am pleased with the results from my Minolta cameras! 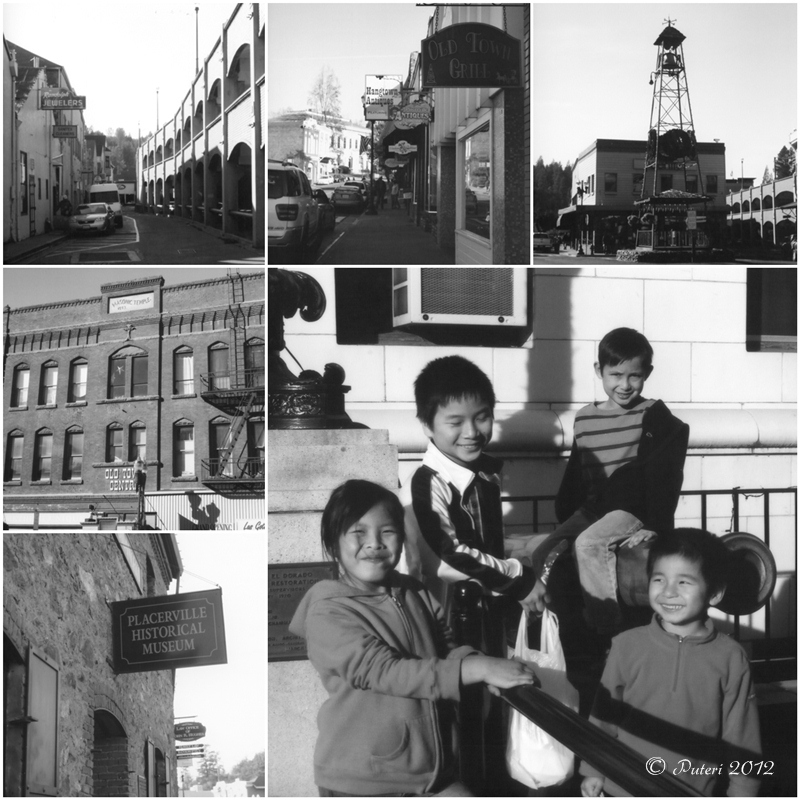 The pictures, taken in Old Placerville, in this collage were taken with the Minolta Hi-matic 7s. I have had it for about 3 years at least and this was the first I'd tried it out. The first shots I took with it, I forgot to focus on the subject by utilizing the built in parallax correction. And there were at least four instances where I forgot to remove the lens cap!! I am rather pleased with the output of this camera! 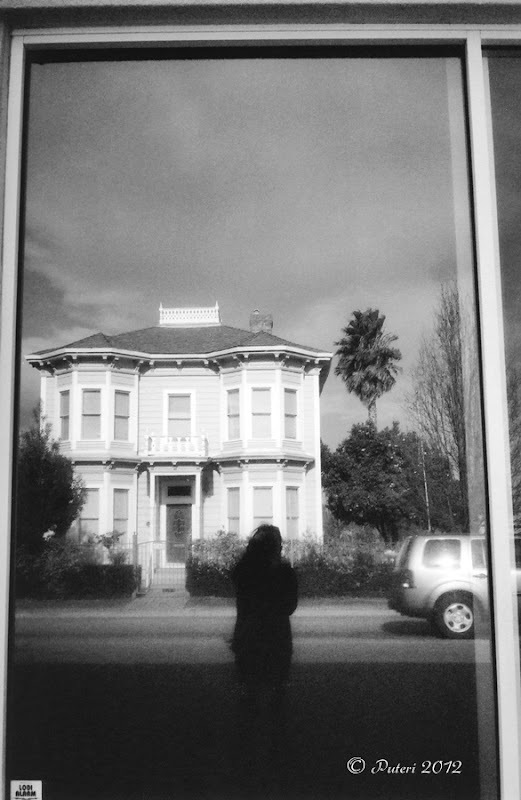 Next, I will be using expired film with it, the better for producing lomography effect! 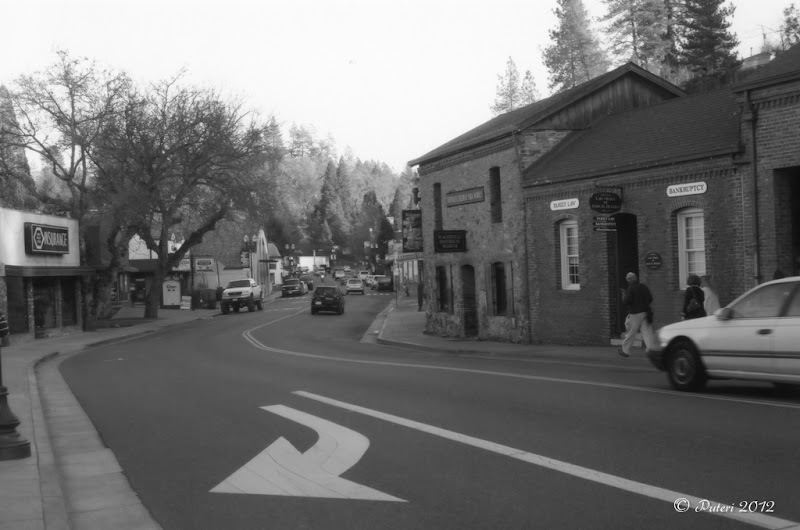 Here's another shot taken with the Minolta Hi-matic 7s of Main Street in Old Placerville. I forget how dependent I have become on the auto-focus function of the digital cameras! 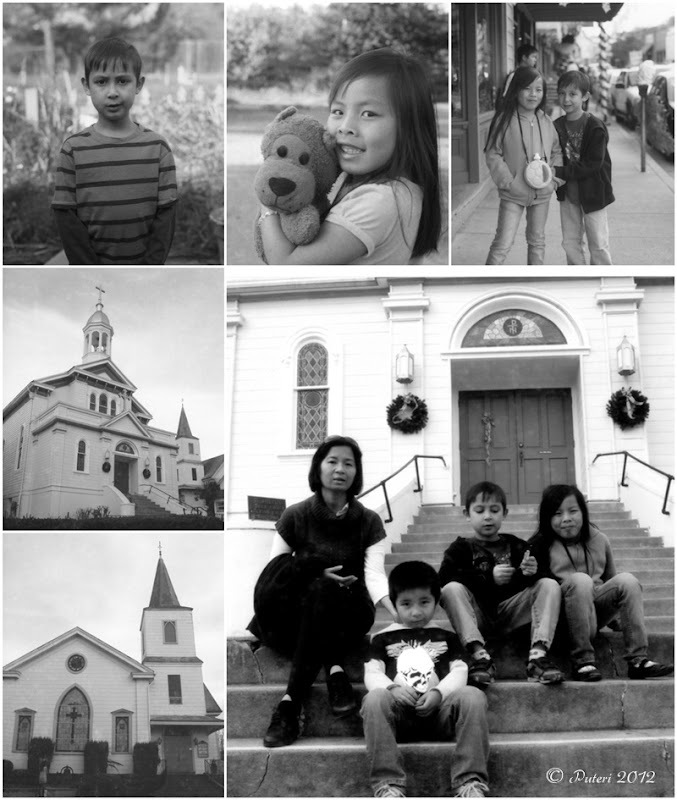 The pictures in this collage were taken with Minolta X-370 using 28mm f2.8 and 50mm f1.4. The focus on the majority of the pictures of people was not particularly sharp. It was a lot easier to focus on objects. I owned a Minolta Hi-matic AF2 when I was a college student in the early 80s. 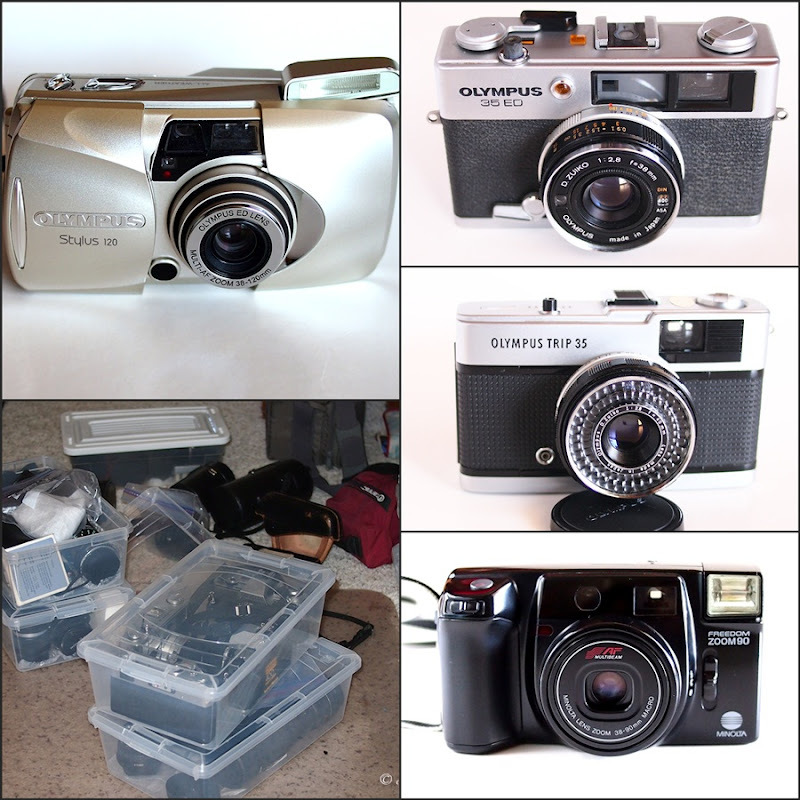 I was always happy with the output of that camera and when I saw them on ebay, I just had to get one! I got a beautiful looking one for under $20 and I just couldn't wait to try it out. I used a C41 process roll of black and white film because I didn't want to wait two weeks to get the pictures back! 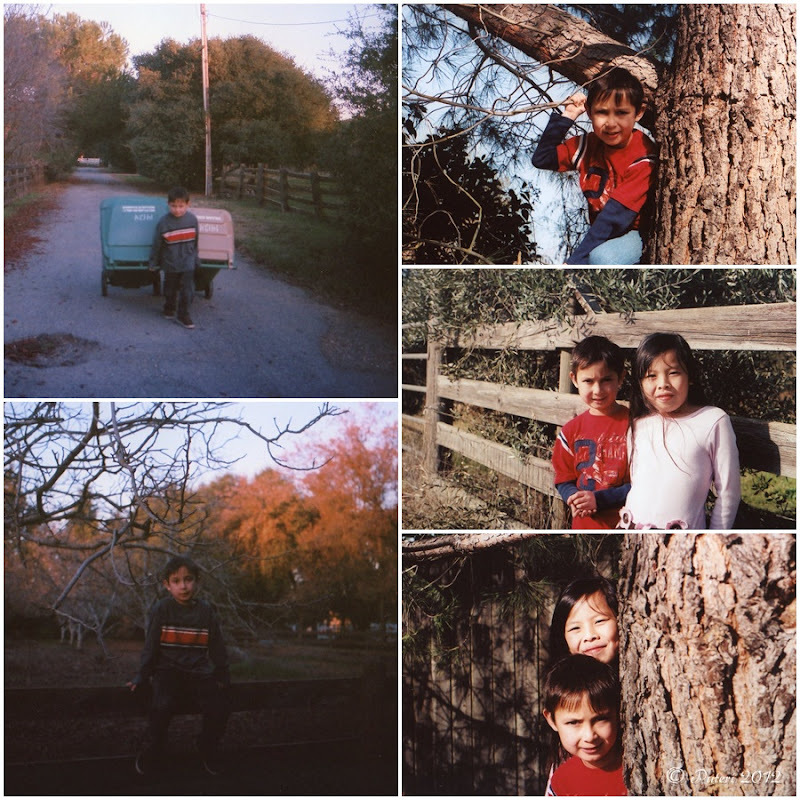 As it turned out, the pictures had a reddish tinge on them because the C41 process black and white film was not truly black and white. That was the first I'd tried such a film. I bought a few rolls, but now I know better - the true black and white films produce much better pictures. 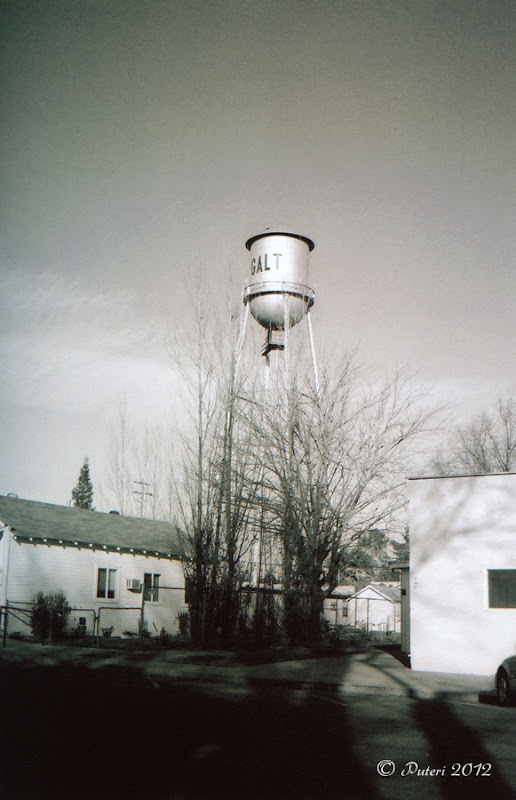 The local water tower here in Galt, shot with Minolta Hi-matic AF2 using C41 process black and white film. It was a clear evening and the moon was inviting. So I took out my tripod, telescope and my Olympus E-P3 which was already fitted with a T-mount to micro 4/3 adapter. This was my first attempt at capturing the moon with the E-P3 and telescope combo. The crisp picture of the moon showing up on the LCD screen was a delightful surprise. It practically covered the whole screen! No crop was needed for this shot! It's been a while since I took out my OM 50mm f3.5 auto macro lens. 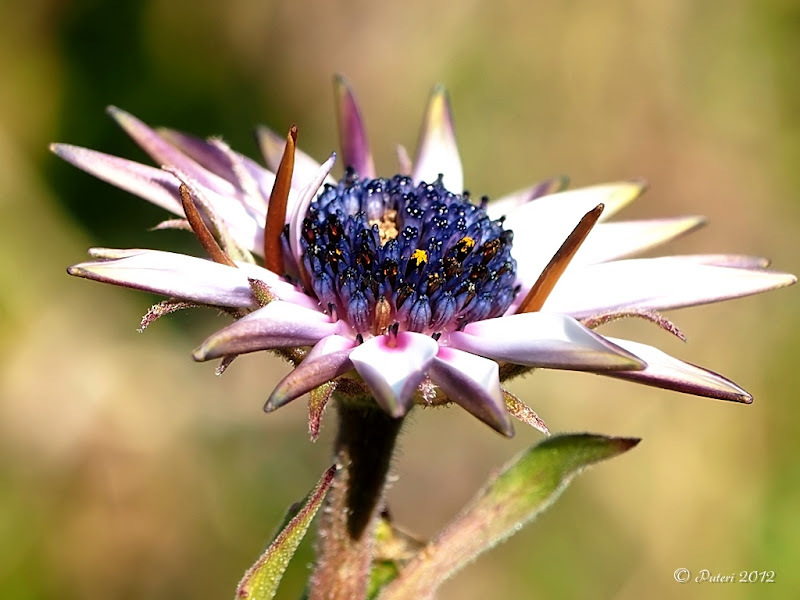 This winter we are experiencing a very mild winter and despite several days of frost there are still daisies on the bush! They are always one of my favorite macro subjects. Here's a shot of another daisy. 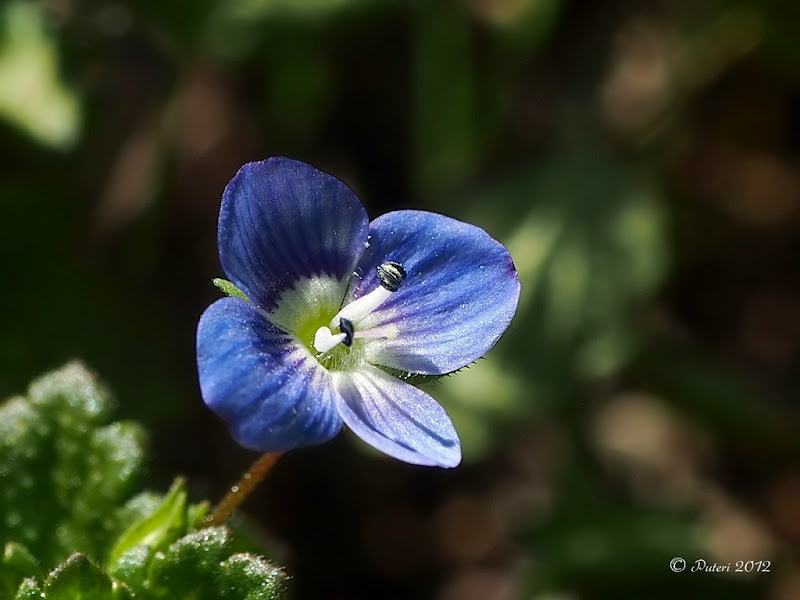 What a pleasant and delightful surprise it was to see Bird's Eye Speedwell on the ground in the winter! 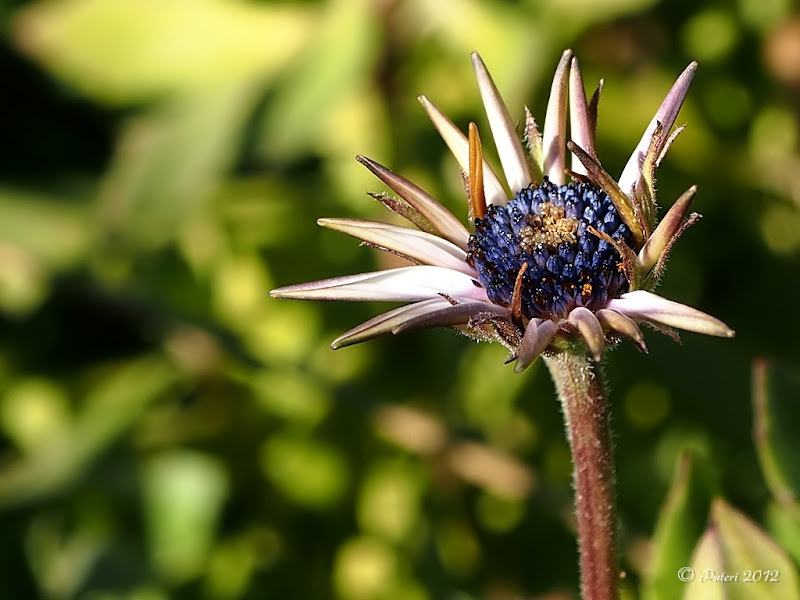 In the spring the ground would be covered with this pretty flowering weed! These are very tiny flowers and they measure not quite half an inch in diameter. How can I not take a picture of my cat that loves to be with me in the yard when I am holding my camera? She was having a jolly old time "bathing" in the dirt that the gopher left on the ground!